5 ohm Sounder circa. 1920. This A.T.M. 4 ohm Sounder has the number 818 stamped on the timber base. Western Electric Company round anvil Sounder circa 1880’s. The sounder has an unusual round anvil. I believe that this is a transitional design between the Western Electric rectangular frame sounders and the Western Electric all round frame sounders. The coils on this sounder have been re-wound and the unit tested at 4 ohm. A 20 Ohm Mainline Sounder manufactured by The National Electric Mfg. Company in Milford, Connecticut. 1890 – 1900. Instruments from this company are scarce due to the fact that in June 1901 The Bunnell Telegraphic and Electrical Co. announced it has purchased the entire business and factory of The National Electric Mfg. Company in Milford, CT. This facility, which was already producing district and fire alarm call boxes and registers and included a foundry and japanning plant. They re-modelled the factory, upgraded its machinery, and afterwards claimed to have the ability to produce 700-800 instruments a day. A nice original sounder with the horizontal spring return, aluminium armature and large slotted postal terminal screws. It has been tested for continuity and works on 3 volt. This sounder is marked on the main lever J.H. Bunnell & Co, New York. U.S.A. and is labelled “Ghegan M.L. Sounder”. The wood base measures about 5-1/2 x 3 inches and is stamped 150 ohms. It is a main line sounder for use directly in a Morse railroad or WU land line. This example also carries a stamp mark for the Northern Pacific Railway which ran across the northern tier of the western United States from Minnesota to the Pacific coast. The major parts are made of brass with the coil covers appearing to be of Bakelite and have a grey painted base. The coils have been tested and work well at 4 volt. It has an unusual rack and pinion adjustment for the coils. The coils do not move but the gear driven slide moved the iron armature which is under the coils in and out, this varies the magnetic flux to the main lever armature. Ghegan was an old time telegrapher; inventor and major share holder within J.H.Bunnell and after Jesse’s death in 1899 took over most of his duties. As an inventor he had the expertise and was well respected by telegrapher and railway communities. He was made vice president and works manager of Bunnell in the summer of 1903 but by Christmas he had became president after the untimely death of Albert Wise. 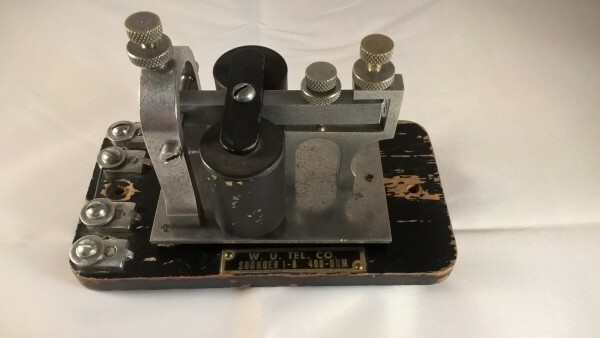 Western Union Telegraph Company 100 Ohm Mainline Sounder 15 - C manufactured by J.H. Bunnell & Co. Circ 1901. This sounder is marked on the main lever J.H. Bunnell & Co, New York. U.S.A. and stamped on the brass base plate “Ghegan Patent July 16 1901”. The wood base measures about 5-1/2 x 3 inches and is stamped 100 ohm Mainline Sounder 15 - C. It is a main line sounder for use on a W.U. Tel. Co. lines, although its use appears to have been changed during its working life. It has a label on the timber base stating that this sounder is now rated at 30 ohm and the resistance across the coils confirms this, so they have been re-wound to this lower rating and probably used on shorter more local lines. The sounder was designed by John J. Ghegan and was given the patent number 678,395 and dated July 16 1901. It has a complex way of adjusting the operating position of the armature in relation to the poles of the magnetic coils to allow for varying current conditions on the line. The pivot position of the armature is raised or lowered in a guided slot within the bridge supports by means of an eccentric shaft, rotated by the turn screw on the side which is marked with an arrow to indicate its current position. The spring tension is adjusted with a mechanism housed under a brass cover. By rotating the screw in, this in turn acts on a lobe on the spring lever pushing it down and putting on more spring tension. When it was retracted the spring force kept the lobe in contact with the screw giving quite precise adjustment. John J.Ghegan was an old time telegrapher; inventor and major share holder within J.H.Bunnell and after Jesse’s death in 1899 took over most of his duties. As an inventor he had the expertise and was well respected by telegrapher and railway communities. He was made vice president and works manager of Bunnell in the summer of 1903 but by Christmas he had became president after the untimely death of Albert Wise. This example is complete and in fully working condition, it is all original apart from having the spring replaced. 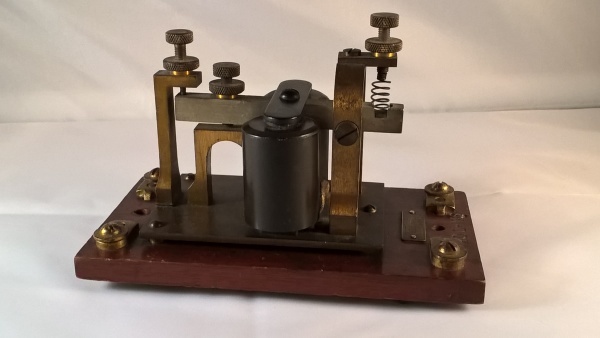 This 4 ohm sounder, model EM-18-A would have been used in the local circuit of a Western Union Telegraph Company office and is the updated style sounder with the spring above the lever rather than horizontally. The resonator plate carries a May 7, 1895 patent date (the location of fixtures on the plate is the subject of the patent). These sounders often have the spring tension adjustment screw located on an extension of the upper frame (Nov 20 1883 patent; on later models the tension screw would be moved close to the centre of the frame, and the extension removed). This sounder has the later Western Electric no. 37A wire terminals. Patent 288881 Nov 20 1883 W.O. Smith -- This patent has to do with the extension or "arm" at the top of the pivot frame, which "gives practicability to placing the [armature tension-spring] screw at a suitable distance in the rear of the vertical plane of the fulcrum-points to secure the proper action of the tension-spring..."
Patent 538816 May 7 1895 J.H. Bunnell -- This patent has to do with the placement and positioning of the anvil, pivot support and coils on the resonator plate so as to avoid any damping of vibrations of the anvil and resonator and thereby increase the volume of sound created. This 4 ohm sounder carries a May 7, 1895 patent date on the resonator plate which refers to the location of fixtures on the plate. Early sounders have the spring tension adjustment screw located on an extension of the upper frame which was covered by the patent dated Nov 20 1883. On later models the tension screw would be moved close to the centre of the frame, and the extension removed. There is a patent issued to Jessie Bunnell on 27 June 1899 US627799 documenting changes to the resonating plate but pictorially still showing the adjusting screw on an extension to the top of the frame. This, along with being fitted with the later Western Electric no. 37A wire terminals dates this sounder to circ 1905. This is a nice early example of the classic “Beeko” Sounder with thumb screw terminals as opposed to the later screw down terminals. This Sounder was patented by Gustave A Zundel and designated Patent No 764,027 dated July 5, 1904. The design is based around the idea of manufacturing a cheap and durable sounder frame being especially desirable for the cheaper grades of instruments, such as learner sets. Although many thousands of these were made, because they were sometimes treated as toys due to their construction, many were discarded which now makes them scarcer to find for collectors. This sounder bears the stamping of J.H. Bunnell & Co, New York, U.S.A. on the arm with 4 Ohm and Patented on the base, along with the key which bears the stamped mark of J. H. Bunnell and Patented on the base, I have seen learner sets with the “Beeko” style key and sounder and bearing the MESCO markings on the sounder arm. I have searched for a reference why these were given the name “Beeko”, but to date with no success so any help with clearing this mystery up would be welcome. The British General Post Office Mainline Sounder No 18372 circ 1930. The British General Post Office Mainline Sounder No 18372 dating from the 1930’s. These majestic sounders have a total resistance of 900 ohms as seen stamped on the front edge of the sounder base and works perfectly at 12 volt. The high resistance of these sounders is due to having a ballast coil mounted on the underside of the base and wired in parallel with the main armature coils. Western Electric Manufacturing Company, established in 1869 was in 1915 incorporated in New York as a wholly owned subsidiary of AT&T under the name Western Electric Company Inc. This example of a 3C sounder rated at 140 ohms is in great working condition and appears to have been little used. It is complete with a silence latch which allows it to be turned off when still wired with other sounders but the line not being monitored. This latch carries the number 12087 which could be a part number but is more likely the line number that the sounder is wired to. This sounder was purchased in 2018 from the U.S.A.
Australian Levenson P.M.G. Type Sounder circ. 1940. This is an example of a scarce Levenson’s Sounder described as a P.M.G. Type Sounder. It has heavily plated fittings on a thick wood base measuring 5” x 3” x 7/8” In a catalogue dated 1941, this sounder is shown and priced at 35/-, or one pound fifteen shillings in old money. Apart from that pictorial view, I have never seen another example. Due to the fact that there are no manufacturers markings on this sounder the only identifying features are the style and knurling of the terminal and adjusting screws. These are identical to those of the Levenson No2 P.M.G. Type key which is more easily recognisable. These similarities and the pictorial view give it its true identity. Both of these examples in the collection were purchased from the same seller in 2018. Levenson’s was a well known radio shop located at 226 Pitt Street, Sydney and was active between the 1930’s and the 1950’s. They sold a number of products including 3 models of straight keys and a range of “Like-A-Flash” Morse keys and sets which included a semi automatic bug key which in all respects was a Buzza Products Double Lever Semi Automatic Bug, re-labelled and marketed through Levenson’s shop. British General Post Office Sounder circ 1900. This is a British General Post Office Sounder dating from around 1900. The total resistance across the coils is only 12 ohms but originally there would have been a ballast coil mounted under the base and wired in parallel with the main armature coils raising the resistance. It is presumed therefore, that it would have been used on a mainline and not just a local loop. This lovely sounder has many similarities to the larger, later sounders that are more often seen including the horizontal spring tension and adjustable fulcrum screws. But the deeply recessed terminal thumb nuts rather than slotted cheese head screw heads would date this earlier. There are no manufacturers marking and no indication that it was used by the military so the presumption is that it was manufactured, and in use, with the Post Office. It has been tested with a 3 volt cell and is in perfect working condition. This 4 ohm sounder carries a May 7, 1895 patent date on the resonator plate and a serial number of 142 stamped on every major part. This can date the manufacture of this instrument to the earlier part of the period 1900 to 1904. The markings on the aluminium lever are of Bunnell Telegraphic & Electrical Company which was formed by the family of the then late Jessie Bunnell who had passed away in 1899. This was done because after Jessie’s death, uncertainty existed as to the future of the Bunnell Company, Charles McLaughlin, the surviving partner of J.H. Bunnell & Company, was quick to reassure the telegraph world by placing ads and business notices stating that their factory was crowded with new work and that business was going to continue as normal. A few months after settling Jesse's estate on October 4, 1899, McLaughlin and four others filed to incorporate J.H. Bunnell & Co. in the State of New York. Jessie’s family were not happy that Charles seemed to be claiming rights over the Bunnell name so went all out to fight this by creating a rival company which during the next four years were bitter rivals. This sounder is stamped W.U. Tel Co. and carries a paper label on the underside of the base giving instructions for use of the sounder and that it only requires a power supply of 1 cell only of gravity battery, there is also the name of Collins, NY, 1900 written in pencil and confirms the early date of manufacture. Instruments carrying markings from this company are quite scarce as the time period of manufacture is short and covers a very turbulent time in the history of the Bunnell Company. W.U. Tel Co Sounder 1-B 400 Ohms. Circ 1930. 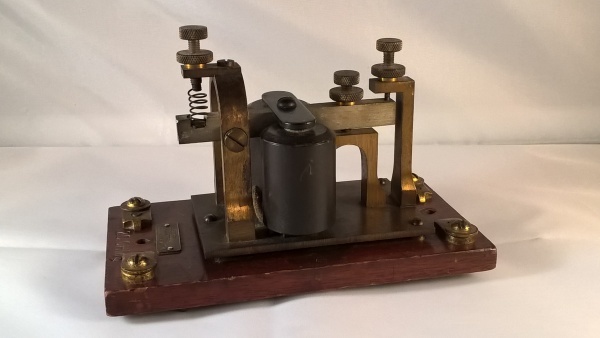 This is a Western Union Telegraph Company 1-B Mainline Sounder rated at 400 Ohms. It was manufactured by J.H. Bunnell and is marked such on the armature. The type 1-B sounder was a very common model for main line use and at some time was repaired in Western Union's New York Repair Shop, seen by painted black base and stamp on the bottom of the unit. It is a very versatile sounder, by having two sets of terminals, it allows this to be wired either for mainline use at 400 ohms or for shorter local lines at 200 ohms by using 1 of the magnetic coils. It was obtained from the U.S. in 2018 and is in fully working condition. Western Electric Manufacturing Company, established in 1869 was, in 1915, incorporated in New York as a wholly owned subsidiary of AT&T under the name Western Electric Company Inc. 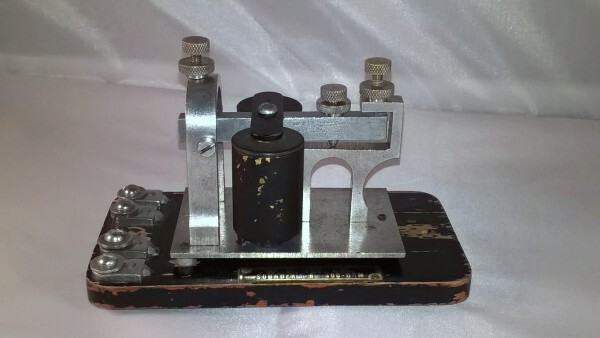 This is an example of a scarce Western Electric Company 4A repeating sounder rated at 20 ohms which was used within a setup called a Polar Duplex Half Repeater following the operation of the pole changer relay. It has two functions; that of a monitoring sounder for outgoing signals, and more importantly, that of insuring a clean break toward the distant end when fast signals are being received by shunting the polar relay contacts, thus locking up the control relay so that the pole changer can make its full excursion to spacing battery. It is in great working condition and appears to have been little used. It has a brass manufacturer’s plate on the top surface of the base and a serial number of 94362 stamped on the underside. It is the precursor of the much-maligned break relay of later years. I have been looking for an example of this sounder for 6 years and this is the first that I have come across. I now have the full set, every component part of the Polar Duplex Half Repeater, as can be seen by the image of this wonderful setup as it would be mounted on the board, fully wired and ready for work. This sounder was purchased from the U.S. in 2019. Used in Telegraphy to amplify the power lost on long cables, by activating a sensitive coil which moves contacts that operate equipment powered locally. The example above is the Post Office Standard Relay “A” version with the beautiful marking of Spacing and Marking engraved on the side in typical Victorian style script and probably manufactured at the Telegraph Works, Silvertown in London. This relay known as an “A” Relay has 200 ohm coils and shorter in length than the Type “B” Relay which followed in the 1920’s, the “A” having a barrel case of 3 ½” where the “B” relay is 4 ¼”. The image above shows both relays side by side to show the height difference. It can be of the polarised or non polarised type the polarised version having a permanent horseshoe magnet and can be neutralised for situations where it is used with a double plate sounder. The relay shown has a double throw contact, is polarised (Has a magnet) and can be set up either in series or in parallel by use of the brass shorting plates. 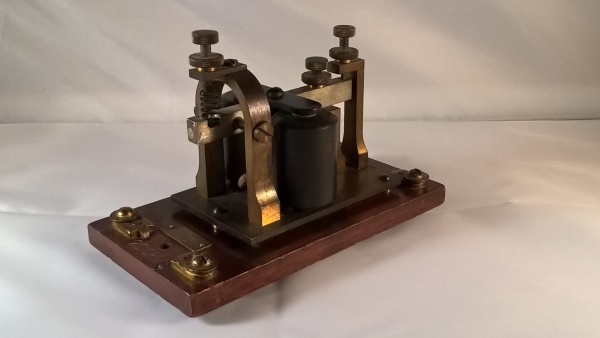 Used in Telegraphy to amplify the power lost on long cables, by activating a sensitive coil which moves contacts that operate equipment powered locally. The example above is the Post Office Standard Relay “B” version. This relay replaced earlier forms known as “A” Relay which had 200 ohm coils and shorter in length. The type “B” Relays have differential coils (two winding on each coil) of 100 ohms each. It can be of the polarised or non polarised type the polarised version has a magnet and can be neutralised for situations where it is used with a double plate sounder, provided it has double throw contacts, which means the pole or tongue “T” is held between “M” (mark) and “S” (space) contacts by means of a spring, this example has a thin leaf spring attached to the contact end of the arm. The relay shown has a double throw contact and is Non Polarised (Has NO magnet). GERMAN TELEGRAPH LINE RELAY by ALBIN GROPER of DUSSELDORF. circ 1930. This tiny relay was used to respond to the weak electrical signals on long land-line telegraph circuits. Delicate adjustment of the spring tension allowed the operator to compensate for changes in the resistance of the earth which was used to complete the one wire plus earth circuit. The resistance of the earth varied daily according to the amount of rain that had fallen and the circuits required frequent adjustment. The coil resistance is 400 ohm which would be right for a main line relay but may have been re-wound as another example seen has coil resistance of 1630 ohms, making it sensitive enough to respond to very small changes in earth resistance. It measure 5” dia. at the base with the main body being 3 7/8” dia. and stands 3 ¾” high. Although this instrument is not stamped with a manufacturers mark it is identical to an example that is stamped by this maker This example would date to the 1930’s and is backed up by the use of Philips head screws which came into wide scale use at this period especially for production line assembly. It is mounted on a slate bed and painted black. It has large slotted postal terminal screws and a painted sign reading ‘Relay No 53. 150 Ohms. Postal Shop’ and just above is a stamping of Postal Tele Co 150 Ohm. It has been tested for continuity and works on 3 volt. Postal Telegraph Company (Postal Telegraph & Cable Corporation) was a major operator of telegraph and Telex networks in the United States prior to its consolidation with Western Union in 1943. Their instruments are quite scarce as many were destroyed after the merger. Postal partnered with the Commercial Cable Company for overseas cable messaging. Postal was founded in the decade of the 1880s by John William Mackay, an entrepreneur who had made a fortune in silver mining in the Comstock Lode. Mackay's original purpose was to provide a domestic wire network to directly link with the Atlantic Cable. Mackay built the Postal network by the purchase of existing firms that were insolvent. J.H. Bunnell Pattern "Standard No. 1 Main Line Relay" also referred to as a "spectacle relay"
J.H. Bunnell Pattern "Standard No. 1 Main Line Relay" also referred to as a "spectacle relay" for the way the coils protrude through the frame. This large relay has a slate over cast iron base, and measures about 5 x 8-1/4 inches. This main line relay has been tested and works well. When Bunnell advertised these relays, they were rated at 150 ohms although other sizes were available up to 300 ohm. This is a later version with the new style terminal fittings and central spring tension winder but retains the bowtie shaped manufacturer’s label. This label is very unusual due to the fact that the label shows it rated at only 50 ohms so was either manufactured for a short line or it has been wrongly stamped. This relay dates from around 1900 – 1920 although it has been in production since around 1883. J.H.Bunnell & Co Ltd. New York. N.Y. Type 2-3 Pony Relay 150 ohms. Circa 1920. A 150 ohm "Type 2-3" relay made by J.H. Bunnell & Company of New York. The wood over iron base measures about 5 x 8 inches. The maker's name, model and relay resistance are on a metal nameplate. This has the newer style (single post) spring tensioner and screw-type wire terminals. Relay SW-37 150 ohms Signal Electric Manufacturing Co. Monominee Michigan 1945 - 52. This relay which is the updated version of the type 916 Commercial Relay is manufactured with a black gloss painted wood or composite base mounted on a cast steel mounting. It is stamped Relay SW-37 and 150 ohms and also carries the stamps of the U.S.Signal Corp 9025 along with a red star and MFP 51. The mark on the surface by the military stamps is not a crack or flaw in the materials but apears to be on the surface, probably when the base was painted. On the underside it has a label stating it has been treated for moisture and Fungus Resistance. Although the date on this label has been blacked out this relay would be dated between 1945 when the 916 was still being advertised and 1952 when Signal Electric was bought by King-Seeley Thermos Co. The condition is as new old stock and apears to be unused. Western Electric Pole Changing Relay 25A patt 15 Nov 1904. 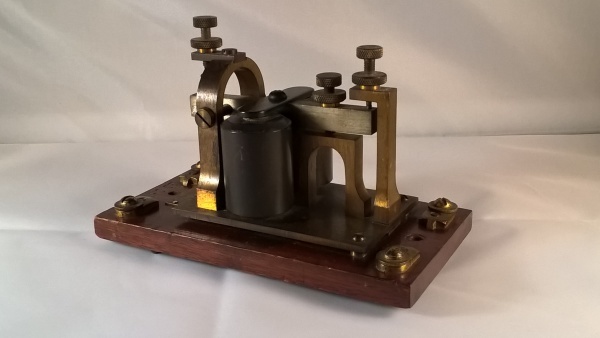 This complex relay is part of a telegraph set that was designed and used as a Polar Duplex Half Repeater. The pole-changing relay 25A responds to signals sent in the local loop. It is identical to one-half of an Athearn repeater, with the exception of having contacts on the back side of the tongue as well as the front, and applies outgoing polar signals to the modem's Transmit Data lead. This is analogous to sending into the bridge apex. The duplex, of course, permitted simultaneous transmission in both directions. This led to the situation, so we're told, that required the operator working the sending side to do the receiver's breaking for him or her. The bridge polar duplex made use of a Wheatstone balanced bridge to permit signalling in both directions combined with reversals of the line current for signal transmission. This polar, or double-current operation as it was called, proved much superior to the single current, open-and-close working of the ordinary Morse wire. Instead of waiting around for the wire to assume its steady-state condition, putting reverse battery to the line gave it a substantial shove. Since the receiving relays depended on direction of the current through them, rather than magnitude, a system resulted that was very reliable under a wide range of adverse line conditions. Western Electric Polar Relay No. 30A 400 Ohms. 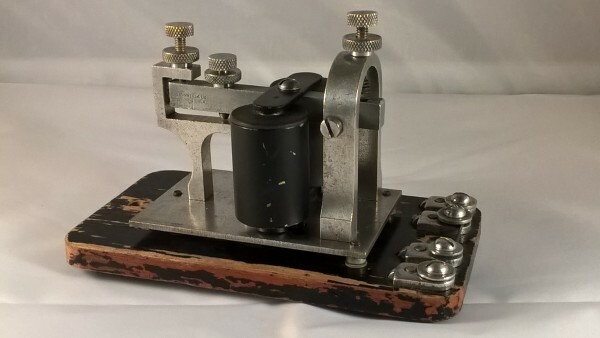 AT&T Co, The American Telephone and Telegraph Company, was formally, in 1885, AT&T Long Lines and since 1994 is AT&T Corp.
Polarized or “polar” relays like this unit used a special coil-mount to eliminate the springs and coil adjusters. The coils were mounted to one end of a permanent magnet and the armature connected to the other end, so the coils and the armature had opposite magnetic polarity. Without an incoming signal the armature, attracted equally by both coils, sat balanced between them. The coils were wound in such a way that an incoming signal reinforced the magnetic field of one coil and reduced the field in the other, attracting the armature to one side to make contact and activate the relay. This type of relay was used in a Polar Duplex Half Repeater setup. This is a Western Electric Control Relay No. 24-A, rated at 100 ohms with two 50 ohm magnets. It has two sets of contacts and is used within a Polar Duplex Half-Repeater setup. Within that setup, the contacts of a polar relay, typically a W.E. No30-A, drive the control relay, No24-A or silent transmitter, as they are sometimes called. This relay serves to repeat incoming signals to the local loop to the subscriber, while holding the pole changing relay, No25-A, to its left closed, on space, position. With this setup, and directly in front of the No24-A, is a No 3-C sounder which has its windings in series with those of the control relay and of which acts to monitor the received signals. This is a scarce relay and a great addition to the collection. It was obtained from the U.S. in 2018 and is in fully working condition. W.U. Tel. Co Relay No. 4-D. 100 Ohms. Circ 1930. This is a No. 4-D relay manufactured by Spies Electric Works of Chicago rated at 100 Ohms. It has a marking of the Western Union Telegraph Company so was used on their lines. This relay has two operating terminals and three switching terminals although only two are generally wired, it is unclear what the purpose of the extra terminal was for. It was obtained from the U.S. in 2018 and is in fully working condition. Philipp was with Western Electric Co. for a number of years before starting his own business, Spies Electric Works, in 1899. He made telephone and telegraph equipment and later got into the manufacture of automatic signalling equipment for fire alarm systems. Spies Electric Works was initially located above Mathias Klein's blacksmith and tool shop (for which Mathias built a second story) on 564 W. Van Buren St. in Chicago, but eventually moved to 85 W. Van Buren St.
Leach PR-5 Spark Relay circ 1925-35. This PR-5 Relay was manufactured by Leach Relay Co. 860 South Los Angeles Street, Los Angeles. California. U.S.A. Circ 1925-35. And in 1930 was priced at $9.00. The “PR Relays” are all very “fast” instruments. They are designed primarily for short wave tube transmitters and are insulated accordingly. They have three adjustments as follows: The stationary contact is mounted in the end of an adjustment screw which varies the space between the armature and the coil poles. The space adjustment varies the distance that the contacts break. The spring adjustment is on the very end of the driven rod, and varies the tension on the movable contact. The moving element is so arranged that the contacts make “full contact”, no matter how the rest of the instrument is adjusted. There are no hinges, levers nor pivots. They have in reality “a full floating action”. A “PR Relay” should be used in every short-wave tube transmitter to handle the high voltage of some circuits and the high amperage of others. The ideal combination for faster, snappier and better sending is a PR Relay operating in conjunction with our “Speedoplex No 2 Key”. The PR-5 Relay is designed for circuits carrying anything up to 250 watts. It has a lacquered brass finish, operates on 6 volt D.C. coil resistance 7.5 ohms. ¼” PURE SILVER contacts. Copper cooling flanges on moving contact. Bakelite insulation between drive rod and coil mounting also between drive rod and armature. Main base 3/16” Bakelite 3” x 5”. Cedar sub-base nicely bevelled and finished in gloss black lacquer. Overall measurements 3 ¾” x 5 ¾” x 1 7/8”. Price $9.00. The above information was taken from a Leach Equipment catalogue dated Aug 1930. The LEACH BREAK-IN RELAY Model 18 Type S-3 1925-35. Above is a Leach Break-In Relay Model 18 Type S-3 Relay and was manufactured by Leach Relay Co. 860 South Los Angeles Street, Los Angeles. California. U.S.A. Circ 1925-35. And in 1930 was priced at $25.00. The primary purpose of this relay is to function in such a manner that it acts as an automatic antenna switch and power relay. The two being combined into one unit in a very novel and extremely practical manner. When the power contacts (which control the current in the main keying circuit of the transmitter) are open, the receiver is always connected to the antenna. Just before these power contacts close, for the next dot or dash, the antenna lead is disconnected from the receiver and completes the transmitter circuit. This action is extremely fast and even though the relay be connected to an automatic sending machine operating from 75 to 100 words per minute, the receiver will always be connected in the circuit between every dot and dash and out of the circuit while these characters are actually “going out” THIS MAKES IT POSSIBLE TO LISTEN IN WHILE SENDING. One antenna being used for the entire layout. The advantages of such a system are very apparent and are briefly described as follows: Let us consider the old style system first. Suppose two stations NOT equipped with LEACH BREAK IN RELAYS are exchanging traffic, one receiving from the other. Now suppose this receiving operator gets interference from some source such as heavy static, other stations, local disturbances or weak signals. With this old hand antenna switch system it would not be possible for him to stop the sender. It would be necessary for him to wait until the sending operator finished his message (possibly several of them) and then ask for a repetition of parts here and there, or possibly of all that was sent. The sender then goes ahead cluttering up the ether with a lot of wasted time and energy, keeping wave bands crowded, using the transmitter much more than is necessary, delaying and interfering with other stations, traffic, etc. Now suppose these two stations are equipped with LEACH BREAK IN RELAYS. The interference comes along, it is NOT necessary for the receiving operator to wait at all. All he has to do to stop the sender is to hold his key down a second or so and give the signal “BK”. The sender would hear this between his own dots and dashes and stop sending immediately, to be advised ON THE SPOT, whether to wait until the interference was over or where to begin sending again. Neither of these operators would have thrown a single switch in sending back and forth as this is all taken care of automatically by the LEACH BREAK IN RELAY. Think what all this means during heavy static or interference from other sources. It means that traffic gets “through” rapidly, accurately and in less than half the time usually required with the old system. This LEACH BREAK IN RELAY may be operated from a small Morse Key, SPEEDOPLEX No2, or any similar transmitting device. It is very “FAST” and will not “lag” or “drag”. It is designed for tube or spark transmitters up to and including 2KW. 3/8” black Bakelite base 4” x 5”. Highly polished nickel finish. Two pair 5/8” and one pair 1/8” silver contacts. Hard rubber shelled coils. The No 215 Type Relay. No D163119-A. The magnetic circuit is arranged Wheatstone bridge fashion, the four air gaps corresponding to the four resistances, with the permanent magnet taking the place of the battery and the armature and windings in the position occupied by the galvanometer. The operating windings are placed over the armature in the form of a single stationary bobbin, sufficient clearance being provided to allow the armature to move within the coil. The relay is provided with six separate windings, four are employed as line windings and two as auxiliary windings to produce the Gulstad vibration. Four insulated copper wires are twisted together and then wound as a single conductor on the relay bobbin. Two conductors are wound in parallel on the top concentric with the line windings. One of the features of the design of this relay is the arrangement which permits of ready removal from the circuit. The square base of the relay is provided with four guide points which definitely locate the relay with respect to the mounting plate and the connecting plug; it is also furnished with fifteen terminals on which the electrical connections of the windings and contacts of the relay are terminated. This is a simplified form of the 209 F.A. relay for use where the operating conditions are not sufficiently exacting to warrant the use of a relay of the 209 type. It employs the same type of magnetic circuit as the 209 F.A. and the same design features of mounting and chatter less armature springs are also incorporated. It does not have such refined adjusting figures nor will it operate with such small currents. It is provided with two balanced line windings. Pictorially it is as a 209 F.A. with the exception of having only eight terminals on which the electrical connections of the windings and contacts are terminated, it also has two line windings. On the top of the Bakelite cover is the mark of a winged helmeted Norseman’s head in red. Any help in identifying this logo would be appreciated. This example of an early mainline relay, manufactured by Siemens Brothers London, has a serial number of 1143 and would date between 1865 and 1880. We can date this instrument between these dates due to the fact that a Siemens & Halske sales agency was established in London in 1850 but by 1858 was converted into an independent company and named Siemens Helske and Company but by 1865 was renamed Siemens Brothers of London. This remained the case until 1880 when the company was converted into a stock company and became Siemens Brothers & Co Ltd. The coils are individually numbered and stamped along with their resistance. One coil has a number C6768 and 295 ohms with the other numbered C6600 and 294 ohms. And are both covered in leather. The armature gap can be adjusted by rotating the long screw adjuster below the spring tension adjuster which slides the coil mounting bracket along the brass base plate. This instrument appears to have been manufactured for the Australian market given the position and style of the wiring terminals. I have seen another example where the terminals are mounted on the top face of the timber base and would be for the European or British market. This is also backed up by the fact that it was purchased along with other Australian instruments from the same seller. The base measures 7 ¾” x 5 ¼” and is in great original condition. It is missing one terminal screw, and 3 of the four tiny wire terminal screws on the coils but given that it is nearly 150 years old and is in working condition, can be forgiven. It is a great find and addition to the collection. It was purchased in 2018.